ENKUTATASH እንቁጣጣሽ - mudd up! Remember the color-coded Homeland Security Threat Level system? Remember how it made you feel? My latest project is called Enkutatash እንቁጣጣሽ. It’s a participatory music performance transforming security threats into spiritual renewal. 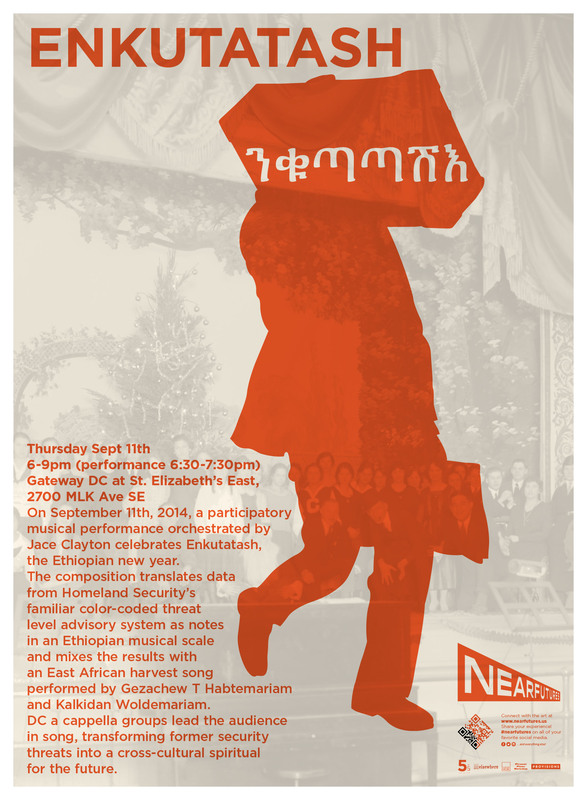 It debuts on Thursday September 11th, the Ethiopian New Year (Ethiopia uses its own calendar system) in Washington D.C.
Enkutatash እንቁጣጣሽ treats the changing threat-level data as a musical score to be sung by a D.C. choir and audience participants, using the five-note (pentatonic) Ethiopian musical scale. Accompanying the choir are several pieces developed from East African harvest/new year songs for masinqo (one-string lute) and voice, performed by Gezachew Habtemariam and Kalkidan Woldermariam. After the performance there will be music by all-lady DJ crew Anthology of Booty and complimentary vegetarian Ethiopian food in tribute to the holiday, from which the piece takes its name and inspiration. Everything is FREE and open to the public. Festival info page | Facebook event invite (pls help spread the word if you’re on Facebook!). The free outdoor event takea place this Thursday, September 11th, at the Gateway Pavilion at St. Elizabeth’s East, in D.C.’s Anacostia neighborhood. St. Elizabeth’s is the former national mental institution that currently houses, among others, the Department of Homeland Security. Doors open at 6, with Enkutatash beginning at 6:30. Event is rain or shine (we will be under the Gateway structure, protected from the elements). There will be shuttle bus from the Congress Heights metro to the event location, & maps for those who prefer to take the 10-minute walk through the grounds of St.Elizabeth’s. When curator Stephanie Sherman approached me about doing a site-specific composition in the capital for her Near Futures / 5×5 Festival selection, I knew I wanted to engage with D.C.’s role as a center of government as well as its reality as home to the largest Ethiopian community outside of Africa. Mixing homeland security threat levels with African songs about returning to one’s homeland to celebrate the new season… Making various systems audible and overlapping, bringing ourselves into the picture with voice. When I told them I was looking for a masinqo player, my friends in Debo Band and The Ex both directed me to the hugely talented Gezachew. And Josef Palermo suggested the Sept 11/Ethiopian New Years connection which grew into the title & date of the piece. Five colors, five notes, many ways of understanding and cherishing the day.